This article first appeared in The Edge Malaysia Weekly, on November 20, 2017 - November 26, 2017. SINGAPORE-LISTED OUE Lippo Healthcare Ltd, formerly known as International Healthway Corp Ltd (IHC), is shelving plans to develop a prime parcel of land located in the vicinity of Petronas Twin Towers and Jalan Bukit Bintang in Kuala Lumpur and putting it up for sale, sources say. 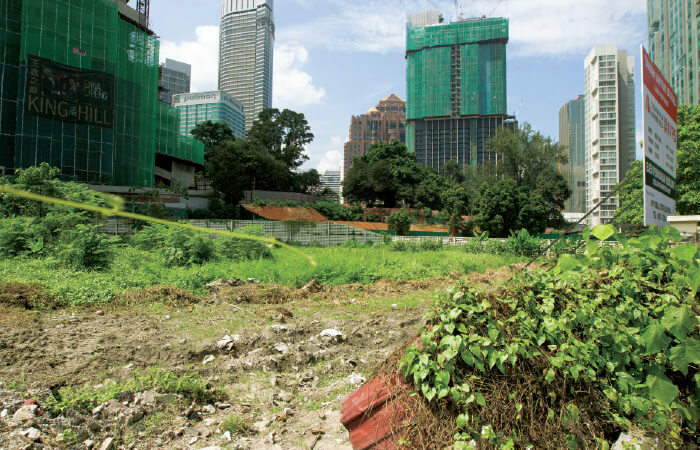 If recent land transactions are anything to go by, the vendor may be able to get as much as RM200 million — which is more than double what OUE paid six years ago — for the 1.17-acre, or 50,860 sq ft, parcel in Jalan Kia Peng. It is unclear why the group decided to sell the land, which is located between Istana Johor and Sri Kelantan. Prior to this, it had plans to develop an upmarket medical hub with serviced residences and had already obtained a development order and signed on an international management firm to operate the planned serviced apartments and residences. It had also secured financing for the project, which was scheduled for completion in 2018/19. When contacted, OUE group finance director Loh Chee Meng declined to comment, but said the group will provide updates to the market and its stakeholders in a timely manner, as and when it has any material corporate developments. It is worth noting that in February, property group OUE Realty Pte Ltd made a takeover offer for IHC and subsequently, took control of the company. The land sale may have been prompted by the change of guard in the company, as well as business direction, although OUE, too, is involved in property development. The current soft property market could have also contributed to its decision to sell. OUE provides healthcare services, ranging from operating hospitals to trading and supply of pharmaceuticals. It is also involved in the integrated medical real estate business, including the development of medical real estate. Coming back to the Jalan Kia Peng land, The Edge managed to identify the site after a visit to the area. A signboard at the site shows that IVPS Real Estate — an affiliate of Cushman & Wakefield in Malaysia — has been appointed the exclusive marketing agent for the said parcel. When contacted, an official from the firm declined to comment. IHC’s wholly-owned subsidiary, IHC Seasons Residences Sdn Bhd, originally purchased the leasehold parcel for RM81.4 million in 2012. The land has 91 years remaining on the lease. At this price, it works out to RM1,600 psf. Recent reported transactions in the area include the sale of the 81,287-sq-ft Germany Embassy land in Jalan Kia Peng in April 2015. Malaysian Resources Corp Bhd (MRCB) paid RM259.16 million, or RM3,188 psf, for the tract. In January last year, Kumpulan Wang Persaraan (Diperbadankan) bought a 5,048-sq-m parcel in Persiaran Stonor, just a stone’s throw from Jalan Kia Peng, from the Federal Lands Commissioner for RM140 million, or RM2,578 psf. Eleven months ago, MRCB sold its one-acre parcel in Jalan Kia Peng, near Kompleks Kraf, for RM4,132 psf to Mass Rapid Transit Corp Sdn Bhd (MRT Corp). If the price paid by MRT Corp is anything to go by, OUE’s land may be able to fetch RM200 million. In 2013, IHC obtained a development order with a plot ratio of 10. It had planned to develop a 33-storey building with a gross floor area (GFA) of 507,648 sq ft — comprising specialist medical suites (45,208 sq ft), retail units (100,104 sq ft) and serviced residences (362,335 sq ft). The development would have also included 700 parking bays. IHC had signed a management agreement with Marriott International Inc for the Marriott Executive Apartments. The 155 serviced studios and one, two and three-bedroom serviced apartments would have occupied 18,000 sq m.
IHC also secured RM190 million in financing from Public Bank Bhd in 2014. According to the latest information on Companies Commission of Malaysia’s website, in the financial year ended Dec 31, 2015, IHC Seasons had liabilities of RM159.64 million, of which RM87.15 million was current. Total assets, as at the same date, were RM218.89 million. The company also had RM52.89 million in accumulated profit.